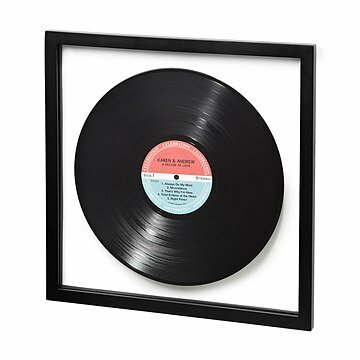 Commemorate a newborn solo act, a romantic duet, or your favorite golden oldies with this custom record art. Made from an upcycled vinyl LP and suspended between two pieces of glass in a floating frame, Jeff Davis custom wall art is sure to top the charts at home. With a choice of two retro stylings, the lyrical words you compose for your label can commemorate a newborn solo act, a romantic duet, or your favorite golden oldies, along with up to five songs with personal resonance. Framed record hand-assembled in Philadelphia. Frame made in USA. Please check out the Personalized 45 RPM Record also by Jeff Davis. This is a very unique and fun gift. The product looks just like the picture. I've purchased this as a gift before and the recipients loved it so much I was immediately drawn back to it for my friend's anniversary. I customized it with her and her husband's names, wedding date, and the songs played at their wedding. They're huge record collectors and love listening to new finds together so and this was such a fun and unique way to reflect that in combination with the best day of their lives. The artist is very easy to work with and responds very quickly to adjustments. I honestly hope I have the opportunity to gift this to someone else in the future as well! The item was beyond perfect but I feel as though the artist is poorly served by the website. My experience with customer service was beyond abysmal...slow response, inadequate answers, bad attitude. This was a very special gift. I love that we can look at it and see our favorite songs. It's the perfect display for all of our records. I only wish this was something you could actually play. Absolutely love this original gift idea. Gift to brother for retirement to hang in his studio. My neighbor was soooo moved by this gift and has it hanging in his office now - showing it off to anyone that comes by. I ordered this for my hubby, for our anniversary. We love music and all things vinyl. Being able to customize this and being able to include 5 of our most favorite songs, I just found it to be the perfect, thoughtful gift. And knowing the artist is using old/recycled records, it's just a bonus! It was perfectly packaged and it is even better looking in person. I love the colors, love the retro look of the font and style...I just love it! I'm sure he will, too. Will proudly display this at our home! Was so incredibly happy when I opened the parcel and saw how this turned out. Cannot wait to give it to my dad for his birthday. He will love it. Great quality and such a one of a kind gift. Thank you so much! It looked exactly like the picture and I loved the fact that we were able to personalize it for him!